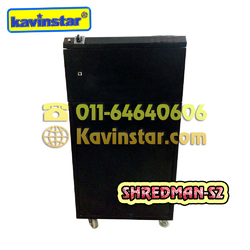 Kavinstar® has an auto start/stop feature, but after shredding it does not shut off. Do I need to return the shredder? In most cases, if a shredder is running continuously, this does not indicate that anything is broken. A majority of Fellowes shredders have 2 small electronic sensors in the throat of the paper entry slot. These are designed to work by shooting a signal to each other; when the signal is broken (by paper entering the throat) the shredder turns on, and when the paper passes through completely, the sensors are able to recognize the signals and the shredder turns off. If paper dust, debris or oil has covered the sensors it can break the signals (indicating to the shredder that paper is being entered) and can cause the shredder to run continuously. This is a little bit more of a problem on cross cut shredders since the oil can very easily cloud the sensors. The good news is that it is as simple as wiping off the sensors to clear away anything that may interfere.The best, long lasting and economical solution to all shredding needs anywhere in India!